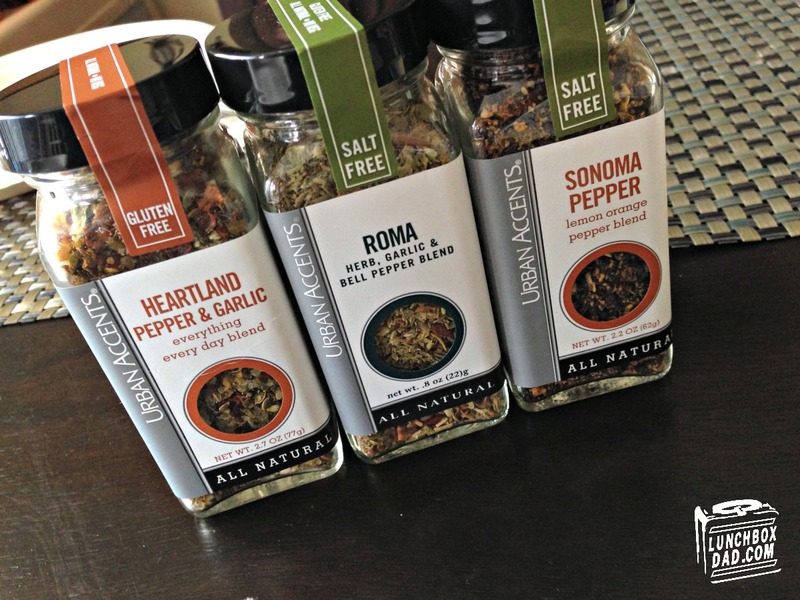 Lunchbox Dad: Review: Urban Accents Spice Blends, a Lifesaver for Busy Parents in the Kitchen? 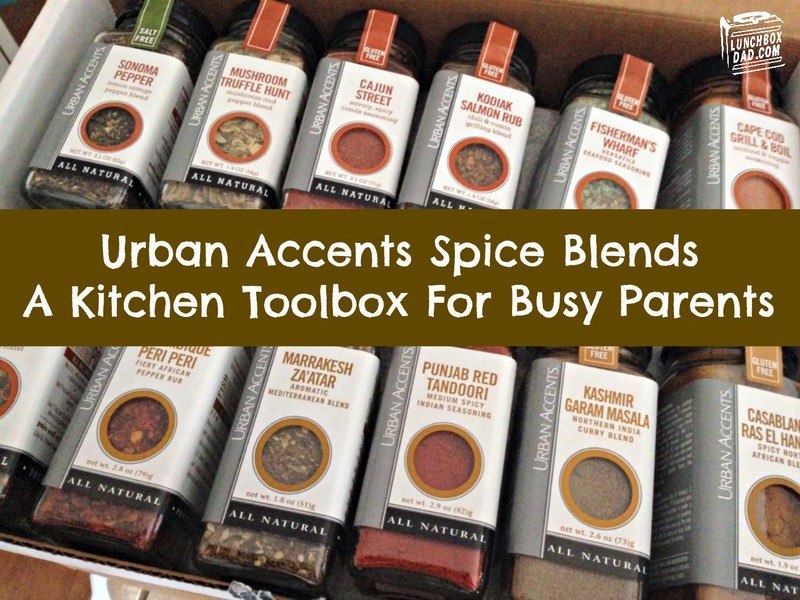 Review: Urban Accents Spice Blends, a Lifesaver for Busy Parents in the Kitchen? Sometimes I like experimenting in the kitchen to see what new combinations of flavors work and what new recipes I can come up with. However, most of the time I'm dealing with kids who want to eat now and who don't want to take a chance on something new. Basically, when it comes to spices I stick with what works but that also can cause me to get caught in a rut. When Urban Accents sent me their Fabulous Foodie gift set to review, I was ready to try something new. When I opened the box I was amazed at the vast selection of spices that were included. The problem with having a huge amount of choices is knowing which spice blends to use in specific situations. This is where Urban Accents really impressed me. On every bottle it not only lists what type of food you should use it on, it also gives you tips and recipes. In this particular set, if there is a food you can use a spice on, there is a bottle for it. Vegetables, meats, and even eggs are taken care of. All the included spice blends are also all-natural and gluten free. This gift pack comes with a total of 24 bottles of spice blends divided into five different categories. You get the American Adventures, Old World Classics, Latin Heat, Global Exotics, and Pan Asian Flavor. A mechanic has their toolbox, and busy parents really need to get their hands on this. My wife and I have pretty much forsaken the other spices in our house and go almost exclusively to this box whenever we are cooking. I don't have the space in this post to talk about every single bottle, but I thought I would just mention the ones that really stuck out to my family. If you have read any of my reviews, you know that I talk about products from a whole family's perspective. If there is one blend I would make sure that I always have in my spice rack it would be the Heartland Pepper and Garlic. This will go good on just about anything but especially vegetables. You have a salad that needs a little somthing? Sprinkle this on. You want your corn on the cob to shine? Throw this blend on with a little butter. I'm telling you this will not let you down and people will be begging for more. 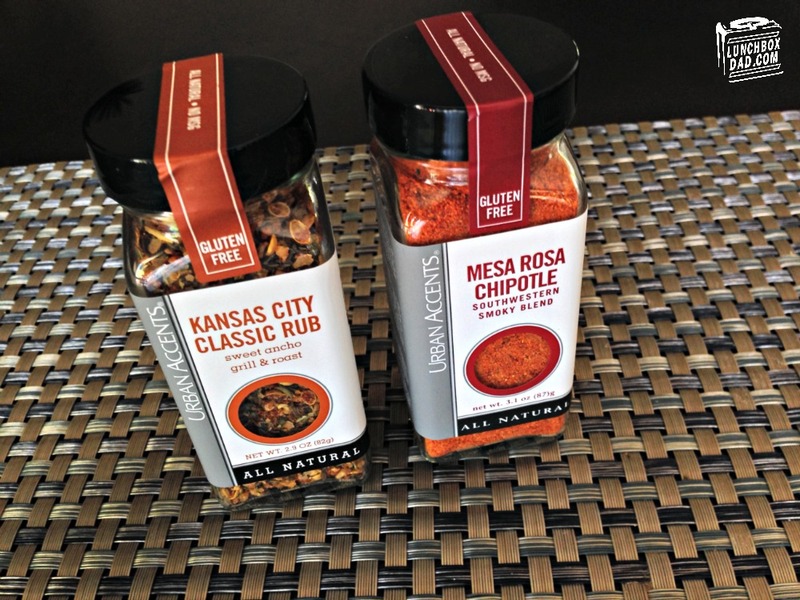 We barbecued baby back ribs and tried the Kansas City Classic Rub and Mesa Rosa Chipotle on them. The Kansas City Classic (bottom rack in picture) wasn't spicy but had many rich layers of flavor. 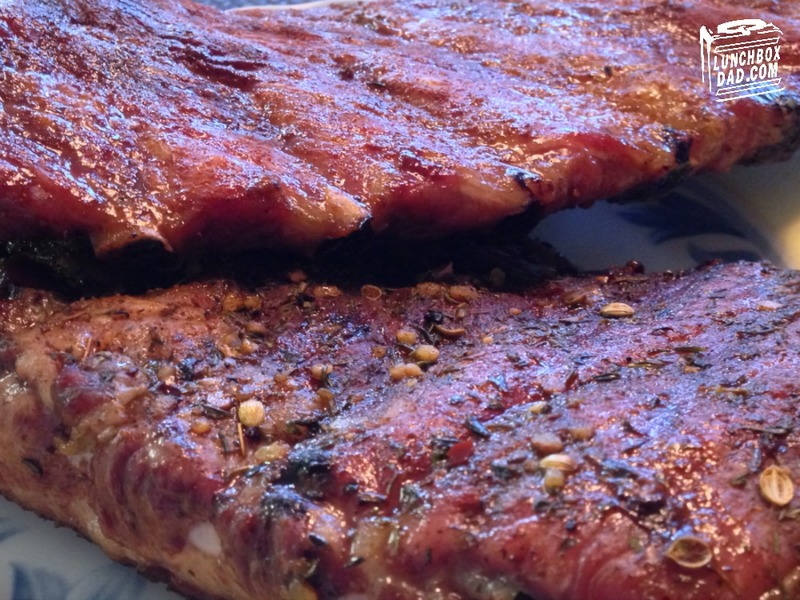 It worked very well with the ribs and I would definitely feel confident with using it on ribs again. The Mesa Rosa Chipotle (upper rack in picture) had a good mild spice, just don't expect much heat here. My father-in-law loved it on the ribs though. I wish it was a little spicier, but that didn't stop me from inhaling the ribs that were made with it! Another dish that we tried with different Urban Accents blends was salmon. The one that always stood out to my family was the Fisherman's Wharf blend. In fact, my entire family are fans of this one, even my kids. If your children will eat salmon, they will like this blend. It's mellow and compliments the salmon without overpowering it. However, the Kodiak Salmon Rub didn't quite do it for us. There is nothing wrong with it, it was just sort of blended in. We felt it was trying to be spicy but wasn't. Stick with the Fisherman's Wharf and you won't go wrong. The last spice blend that I want to mention is the Tzatziki Dill and Garlic. 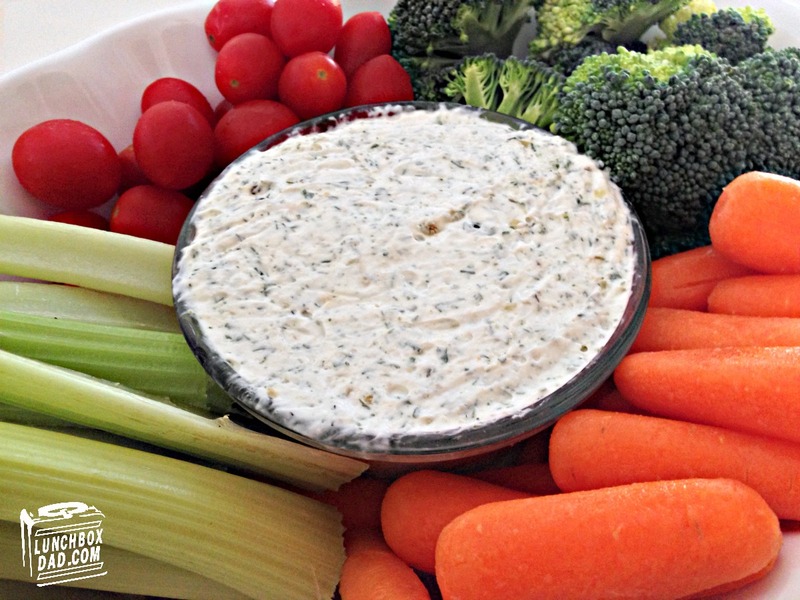 This spice made it ridiculously easy to make a vegetable dip for a party. We just mixed it with sour cream and it was done. The dip tasted amazing and looked complex. People couldn't believe we didn't use a store bought packet. The awesome thing about it is that you can also just make a small bowl and use what you need from the bottle. There is no waste of a whole big packet and it tastes better than what you can get at your local store. Disclosure: I received these products for free from Urban Accents. I have received no other compensation for this post and the opinions I’m expressing here are solely my own.